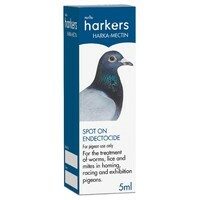 Harkers Harka-Mectin Spot On Endectocide is a spot on treatment for the internal and external parasites of homing, racing and exhibition pigeons. This spot on endectocide is for the treatment of worms, lice and mites. Place 2 drops of Harkers Harka - Mectin per bird onto the skin, under the feathers between the shoulders. For pigeon use only. Do not use this product on young birds less than 8 weeks of age.